Sue's Quilty Bits and Bobs: Where I've Been Lately! Welcome to my blog about my quilting journey! I started quilting in 2006 with a quilt of my own design which started as a cushion cover and ended up as a single bed sized quilt! Now I'm totally hooked....maybe obsessed is a better word for it. What a busy couple of weeks I've had! Not enough sewing for my liking and I really need a weekend at home, hopefully this weekend! My lovely hubby and I had a nice little weekend break in Adelaide at the end of February as we were going to the Norah Jones concert on the Friday night and decided to stay in town for a couple of nights as it was our 29th wedding anniversary on the Monday. Apart from the weather being revoltingly hot and sticky, we had a fantastic time. Stayed in a very cheap motel just a hop, step and jump from King William Street and Rundle Mall, the Paringa Motel located in Hindley Street. As Adelaideans would know, Hindley Street is the nightclub strip in Adelaide and so normally this would put you off from staying there but the Paringa Motel is right up close to King William Street and our room was on the opposite side to Hindley Street, so away from the doof, doof noise! We did however have a bit of air-conditioner noise but I'd rather that than the nightclub revellers! If you are looking for a reasonably priced, budget room but with all the essentials I can recommend the Paringa. After all 2 nights for $180 in the peak of silly season in Adelaide is pretty good. We did book 30 days in advance so that made it cheaper. I work in town just around the corner so I took my bag in on the bus in the morning and wandered around after work to check in and then my hubby bussed it in as well so we didn't need to worry about parking. We wandered about 50 feet down Gilbert Place to The Pancake Kitchen for tea on Friday night. I can't remember the last time I went there. 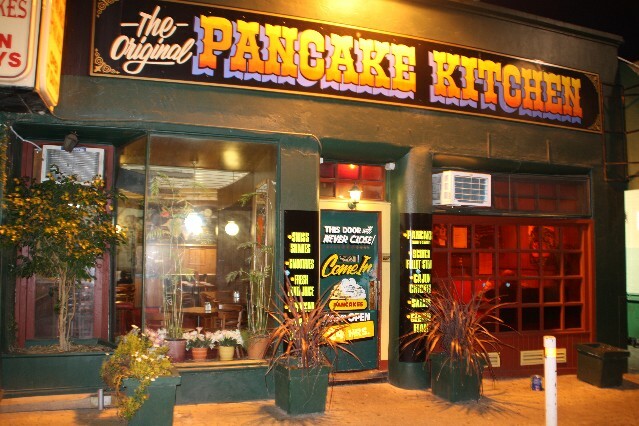 The Pancake Kitchen is open 24/7 and was great. I had the Canadian feast and Brian had the German feast so we did our bit for international relations! Yum, now I feel like pancakes again! As I said it is silly season right now in Adelaide, with the Fringe, Festival of Arts, Clipsal 500, Adelaide Cup, WomAdelaide, Soundwave etc etc all happening over the space of a month or so. We wandered up after tea to check out the street party in Waymouth Street which was part of the Fringe and then wandered back to our room to change and then strolled down to Adelaide Festival Theatre to the Norah Jones concert. She was brilliant and if you ever get the chance, definitely go see her live in concert. Her voice is amazing and her backing band were terrific. Her CD's don't do justice to her voice and now sound a bit flat in comparison to hearing her live! Saturday we headed over the road to Cafe One in Southern Cross for brekkie and it was so good we went back there again on Sunday. I don't often buy coffee in town but when I do I always head there as they have my favourite brand Vittoria and their brekkies were delicious and great value. I wish I'd taken my camera and snapped a photo but then you'd only be drooling all over the keyboard! We walked down Rundle Mall and bought some flowers and then walked to the Wakefield Hospital to visit Brian's sister Kerrie who was recovering from a back operation and then we strolled up Wakefield Street into the Central Markets. I love going to the Central Market but its not good for my hip pocket as I want to buy everything. Seeing as we were staying in town and only had a tiny fridge in the motel room, we had to control ourselves. We did buy some lovely mettwurst and a beautiful double cream brie, some pickled mussels and calamari and stopped for a freshly squeezed juice and I treated myself to a giant 'pigs ear'. Haven't had one of those for ages and now I'll be good for a few more years! It was very hot though, so we strolled back to our room and chilled out in the airconditioning for a while with a cold drink and then got ready for dinner. We caught the tram to Halifax Street for dinner at my current favourite restaurant, The Greek on Halifax. The food there is just fantastic, the service is excellent and I will definitely be heading back again as soon as I can clear off my credit card! We decided to walk back to our motel to walk off dinner. It was a lovely break in our own town and if you live in Adelaide I'd recommend taking a short break in your own city now and again. I just would have preferred the weather to be a little cooler but you take what you get. February in Adelaide was never going to be cool! So no sewing there but hopefully I can post some sewing photos soon as I do have a project which is done but needs a decent photo (or two!). You keep telling me about the beauty of Adelaide... hmm.. you may be swaying me! Mr. Sparkles calls her "Snorah Jones" but I'm quite a fan as well. I love her new album when she jazzes it up a bit. Also, I am the Queen of pancakes! Every weekend when we have the kids, I make pancakes for breakfast, just like my grandma did for me. Have you had them with peanut butter and syrup? It's the best that way! A must try! Thank you for visiting my blog today. I'd love to hear any comments you'd like to make! Free Motion Practice (and another UFO finish! Something New Sampler - Finished! (Real name Sue!) I'm from Adelaide, South Australia and I'm hooked on quilting. (Sounds a bit like admitting I'm an alcoholic when I put it like that!) I live with my wonderful husband (and best mate), Brian and my two fabulous adult sons Kieran and Simon and our retrievers Livvie and Justin. With all those men in my house there's not much room for girly stuff so quilting is my artistic and girly outlet. I'm not a speedy quilter but I'm persistent! I love bright colours and prefer doing my own thing rather than following patterns but I do use them now and again.